from the movie "Joyeux Noel"
What is it about music? Scientists and philosophers and great thinkers continue to wonder why it exists. What is it for? Why is music important to you? I’ve shared this story with many people, but I feel compelled to share it again and again as it keeps me present to why I do what I do in this life. It is why I have chosen the uncertain path of a creator‘s life despite more secure and predictable routes to follow. My invitation to you is to take a few minutes to read this story and consider what music and art provides for you. In that context, I have some offerings for you to consider for yourself or the people in your life. If you are inspired by this story, please share it with others in your life. How a Christmas Carol saved lives. “On a cold snowy Christmas eve in 1914, a German singer saved men’s lives with the gift of music. 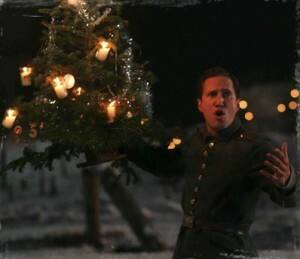 The German tenor was also a soldier and he arrived at a German trench just outside a small French town to entertain his fellow German soldiers. He sang Silent Night. Near by French and Scottish enemies listened from their own trenches. The Scots joined in with their bagpipes. Just hours before, sworn enemies had been brutally killing each other, leaving the dead and dying on the ground between the trenches because retrieval or rescue of those men was guaranteed death. With miraculous courage, the German singer walked out onto the middle of the field and sang O Come All Ye Faithful at the musical urgings of the Scottish bagpipes. The French, Scottish and German captains joined the singer on the field and declared a cease fire for Christmas. All the soldiers came together and had a celebration. They helped each other bury the dead and they played games together. The day after Christmas, the Germans invited the French and Scots to shelter in the German trench as they knew there would be an air raid. The offer was accepted and consequently many French and Scottish men were saved. The French then returned the offer for they knew there would be a counter attack. Many German men were consequently saved. This is why I am a musician. This is my offering to the world. This is the conversation I am expanding in the world. Music serves many purposes. But what inspires me about music is what is expressed in this miraculous story. Music is universal in its ability to connect us and to heal us..
Do you listen for that in music? If not, I invite you to listen for that in music? It is yours for the taking providing you listen for it. All that I offer as a musician is about that. – about love, connection and beauty. Aesthetic beauty is a powerful access to who we all really are. An Amicus Music Duo concert is about connecting with music and a group of people and sharing that experience together. An Under the Piano session gives you an opportunity to connect with yourself on a profoundly deep level and actually be a co-creator and participant in music such that you are physically part of it. It is healing, relaxing and transformative. My CDs are an opportunity to access the relaxing and healing power of music anytime you want to.